Giancarlo Stanton “on track”; Why Cashman never told Betances about his bone spur; A convenient list of Yankee injuries and expected returns; Ellsbury’s locker finally given away. 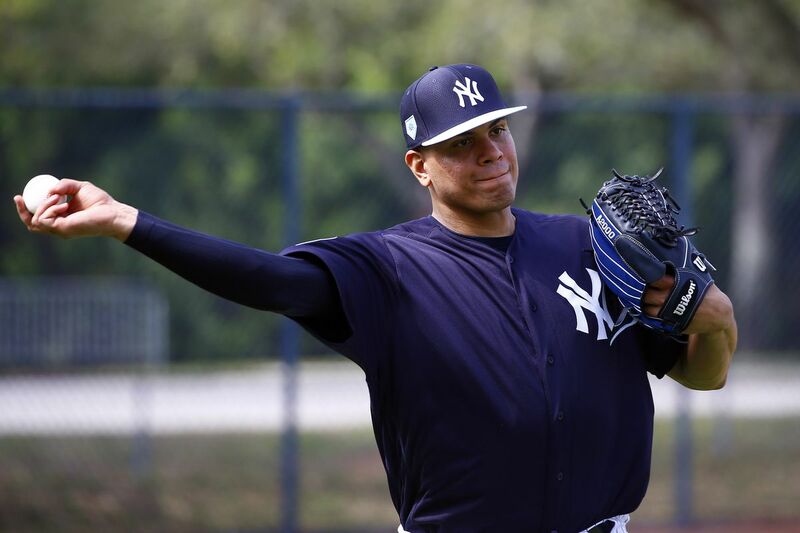 New York Daily News | Kristie Ackert: CC Sabathia made his season debut yesterday, and that wasn’t the only bit of positive injury news; Giancarlo Stanton took swings off a tee and said he felt he was “on track”. Stanton said he could still feel the bicep strain that put on him on the IL just a little bit, but hopefully whatever he’s feeling fades away in the next couple weeks so that Stanton can rejoin the team and the reinforcements can begin to arrive in earnest. He hasn’t had the inflammation before. On the various testing we’ve done since we signed him … [After] drafting [Betances] I gave him $1 million to sign rather than go on to college, and you do a physical and there’s an MRI, and right away that was [a bone spur that was] an incidental incident, meaning it’s not affecting him. There is something there. It’s inconsequential, non-symptomatic. He hasn’t had to deal with this. It’s had no affect on his game or pitching in anyway, shape, or form. The various times we imaged him, if it was for insurance or whatever reason, it’s always been there, but it’s never been something that’s caused a problem. Call me old-fashioned, but I still think the Yankees should have told Betances about the bone spur because it’s, you know, his arm. MLB.com | Bryan Hoch: There are a lot of Yankees on the injured list right now. What’s worse is that there seems to be a new, horrible piece of breaking injury news every hour. It can be overwhelming to try to keep up with it all, but luckily, Bryan Hoch is here with an overview of the injuries and (expected) recovery times. End of an era: the Yankees have given away Jacoby Ellsbury’s Yankee Stadium locker. It now belongs to Giovanny Urshela. Let’s end on some good news today. The Yankees have finally given away perpetually-injured Jacoby Ellsbury’s clubhouse locker. The cobweb-filled reminder of a haunted contract is finally getting a new life, gaining the opportunity to hold on to Giovanny Urshela’s personal items. It’s safe to guess that now that the black cloud and curse have been lifted, this team will go on a 75-game winning streak. Aaron Boone’s bullpen management still leaves something to be desired I have to admit: Aaron Boone’s bullpen management during Thursday’s game is still bugging me. The Yankees have gone full 2013 on us with this lineup Sunday afternoon’s lineup isn’t great. This Article has a component height of 11. The sidebar size is medium.